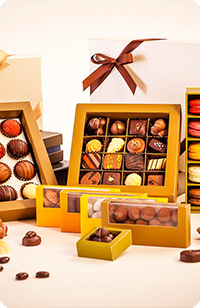 Schoggi Meier mainly supplies pastry and bakery items, such as birthday cakes, assorted cakes, cookies and Butterfly made from New Zealand butter puff pastry. With 24 hours operation in our production house and without adding any preservative, we can guarantee every piece of bit you are having is freshly made and healthy. Our home-made praline & macaron is our signature products, you will never go home with empty hands! With all the products in the shop, our dessert bar, one of the very first ones in Macau, embraces dining area for our customer to leisurely enjoy our dessert. Not only the “in your face” freshly made desserts are available, our freshly brewed expresso will certainly delight coffee lovers. A cup of cake latte with our signature dessert platter, it is really a joy, isn’t it? Best viewed in 1024x768 with IE 7.0 above.Copyright © 2011. Gourmet House Macau Ltd. All rights reserved.Web designed by hkwp.